Discussion in 'Work in Progress' started by Field Magic, Mar 9, 2018. King of the Streets '18 is the spiritual successor to King of the Streets which I released almost 7 years ago. Inspired by Mortal Kombat and Street Fighter and a homeage to classic 2d Fighters, King of the Streets brings elements of all these and tries to make a fun, nostalgic experience. Characters again will be based off real world people, friends and families alter egos brought to life to compete in the ultimate tournament to the death. I'm finally at a point where I'm comfortable letting people play it to see what they think. 12 Fighters including some classic and some new. Each fighter has special moves, rage moves, overkills and a reason to fight in a tournament to the death. A fast, bloody and fun fighting experience. Pre-rendered 3d art style to give it that nostalgic "MK / Killer Instinct" look and feel. All characters likenesses are based of friends and family. Animated interactive stages based on real places found around Auckland / New Zealand. Music composed by the Original King of the Streets composer, Jordan "Tru7hy" Koziol-Repia. Sweeney and B-Pac are completely playable. All special moves, rage moves and 3 overkills (more will get added later). A Training stage and a basic Leabank park (Missing the crowd and ambient animations). Versus mode (1p vs 2p, 1p vs cpu, cpu vs cpu). You can also change some of the settings in options (Controls, sound volume, resolution size etc). Voices are taken from Street Fighter for the time being, these will be replaced eventually. I needed something to work with in order to set up all the options and variables. I recommend you change the keys for both Player 1 and Player 2 in the options before starting a game. NOTE: If you get the "Unable to find game" error, run the game from your desktop. It seems common within the forum and still can't figure out a fix. Because I forgot to add the movelists to each zip I have uploaded here for you to view. I'm not going to go into how to play a fighting game but go through some of the mechanics found in King of Streets. BLOCKING - You can block attack by holding Back. This can be done in crouching state or jumping state to. Grapples beat block. TARGET COMBOS AND ATTACK CANCELS - In King of the Streets Special moves and Rage moves can cancel attacks. You can also cancel lower attacks with higher attacks to perform simple but devastating combos. Tapping a Low attack twice, will perform a Medium attack. A Medium attack can then be followed by a High attack if it connected. RAGE MOVES - Each fighter has 2 RAGE moves which can be performed when your RAGE bar is full. Your RAGE bar will catch on fire when it is full. Your RAGE bar can be filled by doing damage or taking damage. OVERKILLS - Each fighter has a way of adding injury to insult at the end of each fight by performing an Overkill. Overkills can be as little as a Leg break to being set on fire. As of DEMO 1.0.0, each fighter has 3 unique Overkills to discover. I'm very interested in hearing your feedback! IndianaBones, Abdur Olajuwon, YanBG and 6 others like this. Hey! I've been following your project for years by now, I still have the first one to play on my PC! When you uploaded your demo I got it right away and I've been playing since then! So, the intro and layouts from Mainmenu, character selection, loading screens and even after the fights are just amazing! The combos seems quite solid (lp,lp, hp which can be mixed with some skills) and I really like what you did at the end of the fight with that x-ray effect! So I have to tell you that I had lots of fun playing your game all night haha! At moment, there are some bugs on some transitions, if you keep up + front pressed before the match starts, your character won't start jumping at the enemy, if you keep up + back pressed and the enemy attacks before you jump (forcing you into blocking stance), you will have to release "up" and press it again or you won't jump back. Block also cancels back dash and some other movements. And about the characters, in design all of they are looking really cool! About their movelist (from the pictures), it seems that some moves are inverted, or they have the second player in mind (Ex:. Calf Slicer listed as Down, DownForward, Forward punch insteadof back), but well, this stuff is easy to correct! About balance, Sweeney's Calf Slicer is currently a super fast, mid range, hardtoblock, unpunishiable when used at midfield at close range and easily abusable if you use it on against B-Pac. And about B-Pac, I am not sure if it's working as intended, but his grabs are also forcing the opponent to go into blockstance and also, unlike Zangief and other grab characters, his grabs and rage grab attack can be easily countered by any other attack, so if he faces an offensive opponent, his grabs will always lose when crossed against other attacks, amounting that with the fact that Sweeney has 2 unpunishiable movements, B-Pac will suffer alot. Still, I'm really enjoing playing your game, thanks for the demo! I've been waiting for it for so long! 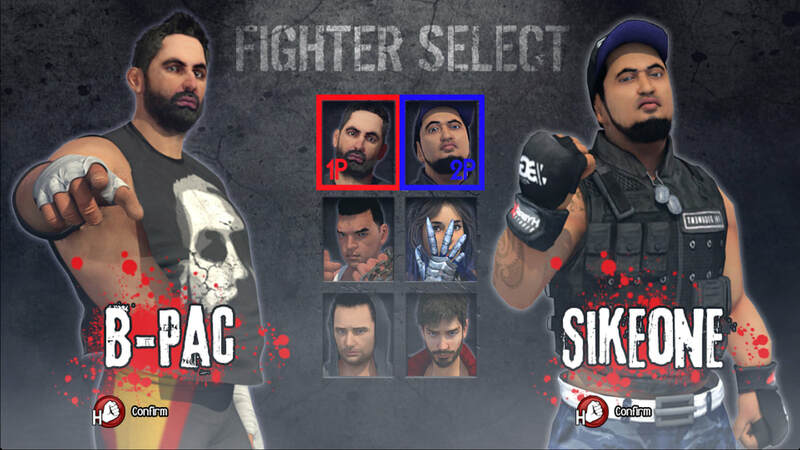 I'm looking forward to check Sikeone and Missi, they are looking so sick in this version! Thanks man! 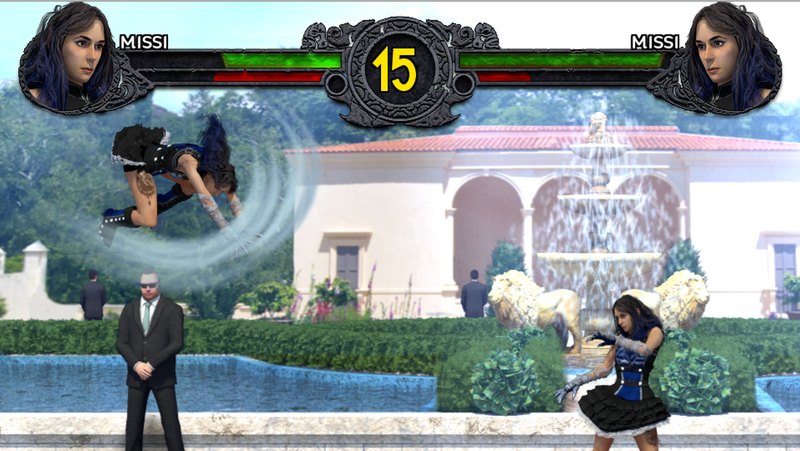 Oh and I am Renato, I'm also a developer working on another fighting game(but 3d, 8 ways walk) called Bloody Justice. It'll be announced only at BGS in a few months, but I could definetelly release a footage for you in case you want to check it out! Field Magic and sitebender like this. Thank you for the support, the demo really is for you and everyone else who has supported the project for all these years and I'm glad you enjoyed it! "if you keep up + front pressed before the match starts, your character won't start jumping at the enemy, if you keep up + back pressed and the enemy attacks before you jump (forcing you into blocking stance), you will have to release "up" and press it again or you won't jump back." Hmm I've never noticed that before, I think I know why too so I'm hoping this is a quick fix. "Block also cancels back dash and some other movements." This one I've known about and just thought no one would notice haha I'll have to fix this one asap, it does get very annoying. "Sweeney's Calf Slicer is currently a super fast, mid range, hardtoblock, unpunishiable when used at midfield at close range and easily abusable if you use it on against B-Pac." B-Pacs grapples causing a block is def a bug, I'm surprised I never picked that up. This is a quick fix. B-Pac in general was a character I had this vision for and I wasn't sure if he was going to be super OP or absolute crap. When I was play testing him, I felt he was so over powered especially when he got in close. His Rage grapple I purposely made hard to get because he can also grapple airborne opponents (And it does so much damage). You're def right and I'll have a look and see what I can do about it. Man your feedback is so valuable I appreciate it. Id love to see what you have done. Thanks to all who have played the demo, I had over 6000 downloads in the first day! I figured Id use this forum post almost like a dev log and update it when I have something interesting enough to show. I've begun adding the 3rd fighter SIKEONE. He's changed a lot since the first game but the attitude remains in tact haha. All his basics and standing attacks are complete. He will be quite well rounded and bit of a rush down fighter. I've also finished designing / rigging another character. King of the Streets will follow the old Tekken games where fighters will get unlocked as you complete Story / Arcade mode. His name is the Reaper and his fighting style is Karate. For more information on him visit the website. Are you doing the modeling and animation yourself? If so, that's some really impressive stuff. A lot of work, too. The game looks...incredibly, aggressively 90s. Its a relief to hear that comes across haha Its all about nostalgia. If I can bring those feelings out some how I've succeeded. 3d animation is so much easier than pixel art. So I don't think its nearly as impressive as some of the stuff you're doing with your sprite and animations. Awesome stuff! That's a crazy amount of work, hahah! Good on you! The computer takes care of the perspective and in-betweens for you, it's true. You still need good keyframes, though, and modeling, rigging, texturing, and all of that other crap is nothing to sneeze at. I think 3D modeling is up there with sculpting for the amount of skill it takes. I've done 3D stuff on and off throughout my life. It's not easy at all, and I think the public definitely underestimates the work that goes into it. Your game is super impressive! Sorry for the lack of updates, I've been doing a lot of traveling for work so haven't had much time to update here. Still making progress on SIKEONE who is a rush down / mix up fighter. Most of his standard animations are down and coded, he just needs his rage moves and overkills and he'll be done. Here is some footage of me play testing what I have done so far of SIKEONE. I've also finished the design of the original King of the Streets boss character VICTOR. I post to the Facebook page regularly so if you want up to date information like the page found on the website. Sikeone is complete! which means I have completed 3 characters. I've started animating and coding Missi who will undoubtedly break up the sausage fest at the moment. Here is some footage of her Basic standing attacks. I've also finished the model and rigged NIFO who is the "Big" guy of King of the Streets. The pause menu is fully implemented now and you can now pause a fight and quit to the menu. Blocking has been completely redone. It doesn't restrict you now when trying to move back or dash. sitebender and sylvain_l like this. Here are some new screenshots of Missi in action and some WIP shots of her stage. All stages are actual places in New Zealand, Missis stage is the Hamilton Gardens. She's going to be very fast and mobile. She'll have a wall jump and have a lot of options to get out of danger. Niels and sitebender like this. Thank you. I've gone for likeness first and foremost, all the characters are based off friends and family. Then I've taken liberties on the proportions haha Big hands and feet to exaggerate it a little bit, so it was never going to be photo realistic. Heres a video I posted a couple of weeks ago on the Facebook page. SIkeone vs Sweeney a full fight with a nice overkill at the end. WARNING - There is blood.... lots of blood. Missi is making steady progress and is getting very close. There have been lots of bug fixes and tweaks behind the scenes also. I've started work on the boxer of the KING OF THE STREETS.... Truthy. Rather than a power boxer he'll be more speed/ technique based. I've been slowly working on a lot of behind the scenes stuff that I want to get out of the way before moving on to the rest of the cast. The pause menu is all set up now, including being able to change the settings and view move lists. This also means all the settings are now "connected" and everything can be changed in the options and its all working finally. I've also polished up the camera and presentation in some areas. Fighter wise I've been working on Truthy the former boxing champion. Here is a quick clip of his counter attacks. I've also designed and modelled another fighter. YOON HO will use a combination of Taekwando and poison projectiles to help wear down opponents. Looks real good. Very impressive! Coming up to the Christmas holidays I managed to finish another fighter which puts the tally up to 5. Truthy the former light heavyweight champion is now fully playable and feels great. As always the voice audio is all place holder for now and all the 'actors' the fighters are based off will do the voices to add that extra touch. I need to step back from coding anymore characters for the time being and finish off some of the little stuff thats been bugging me for a while now. I also want to finish modelling and rigging the last remaining fighters and characters. Lots of little updates here and there too. I have 5 complete fighters and have stopped to go back and clean up the engine and tweak it to make it that much better. - I've finally taken the time to replace all of the sound effects with custom ones. In the process I've set up the "terrain" system, so jump lands and knockdown sounds change depending on the terrain. Adds a bit of life i think. During close ups, there are footstep sounds too (Learning lessons from the first game, i havent added footstep sounds to every animation haha). - Re-done all the "XRay" finishers so they look far more interesting and more brutal. - Stage deaths have been set up and 1 has been implemented! Certain stages have different requirements and "activators". - Added new transition animations to the fighters again to give them a bit of life and character. Looks good! Which shader script from it did you use? Its got some limitations but worked perfectly for what I needed it for. Definitely recommend it. Keep forgetting to try thisn looks so good, dude. Cool to see a Kiwi game too. Thanks bro, i forget to update the thread too haha The first demo is still available for download, its very early but still very playable.. I'm keen to hear your throughts. The game finally has game pad support! It's been set up so you can easily swap out between keyboard or controller.. All I have to do is allow you to choose what connected controller you want to use.